Sonia began her veterinary career working as a vet assistant, then later as an “on the job trained” technician in a small animal practice before obtaining her BSc. from University of Guelph, with a major in Animal Biology and a minor in Classical Languages. After graduating, she moved to Saskatchewan to work with swine, but allergies forced her out of the barn after 2 years. 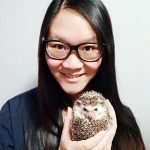 She returned to Toronto and has been working as a vet tech for the past 5 years, mostly in general practices across the GTA. She recently decided to officially pursue the path to becoming an RVT. She graduated with honours from the Veterinary Technician Program at Sheridan College, and obtained her RVT status in September 2018. She was awarded the OVMA Veterinary Technician Excellence Award for “above average standing with an emphasis on clinical practice”. 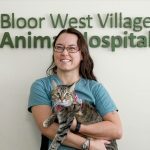 Sonia joined Bloor West Village Animal Hospital as a part time technician in November 2017 while still in college, and in her last year of the program, she spent all her coop hours with us. After having spent 6 months working in an emergency and referral hospital, she joined us full time, and is pleased to be working with a cohesive team of like-minded people who all strive together to provide the highest quality of care for our patients. In her spare time, she sings, plays the guitar, flute and piano. Sonia also loves languages, and hopes to be fluent in Farsi and Mandarin in this lifetime.